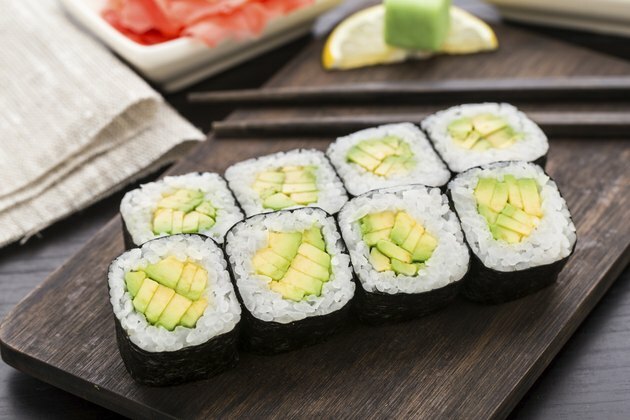 When the sushi craving hits, avocado rolls are a smart choice if you're watching your weight. Lower in calories than most other rolls, these savory treats provide healthy, monounsaturated fat from avocados to help you feel satisfied. The high fat content can lead to excess calories if you aren't careful, however, so use thin avocado slices when making sushi at home. A serving size is just one-fourth of an avocado. Different sushi chefs create rolls with varying calorie counts. On average, however, an avocado roll may contain 130 to 140 calories. That's far more modest than sushi with fried ingredients and sweet or creamy sauces; for example, a shrimp tempura roll may contain more than 540 calories. Don't forget to factor in any soy sauce, which contains about 11 calories per tablespoon, or pickled ginger, which has about 15 calories per tablespoon. Marie Claire: Is Your Sushi Making You Fat?